An enjoyable and basic ute! 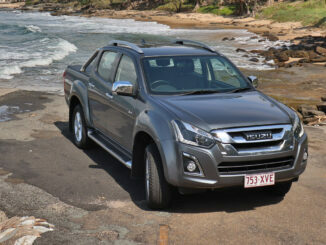 The Mazda BT-50 was a simple and surprisingly nice ute! With almost infinite combinations of strollers, bags and dogs in the tray I could fit 29 shopping bags in when it was empty. 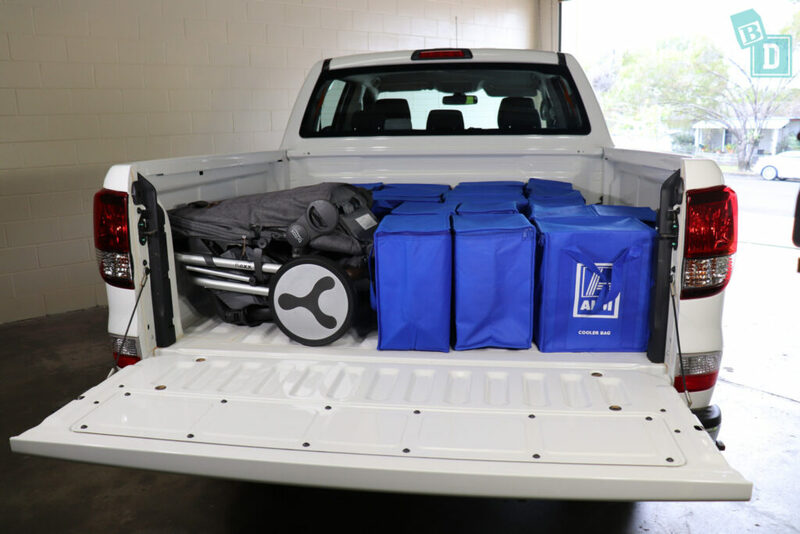 That is five more than the Nissan Navara, one more than the Mitsubishi Triton, the same as the Toyota Hilux and one less bag than the VW Amarok and Holden Colorado! The Britax Flexx tandem and singles strollers fitted in the tray with 21 and 22 bags respectively. 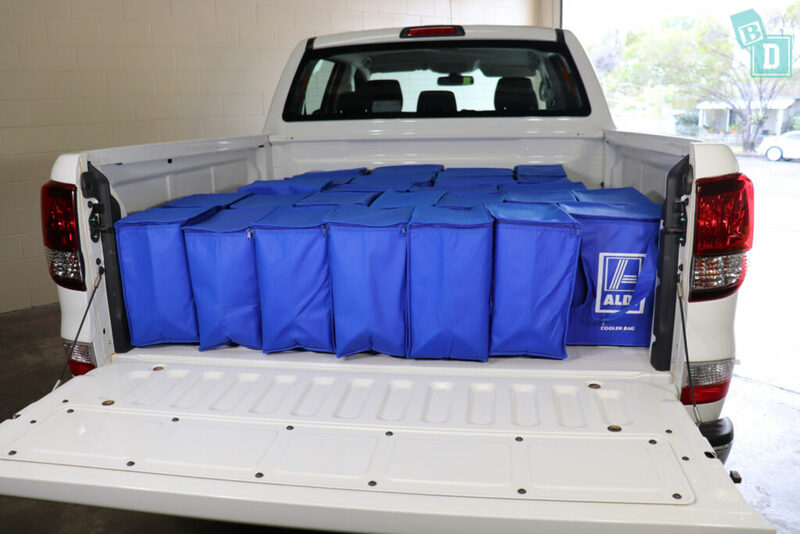 I found I could only reach the first two rows of bags standing on the floor behind the tailgate. Storage inside the cabin of the BT-50 was good also, there were two good cup holders in the front and back that would hold reusable and disposable coffee cups. The door bins in the front and back held a large refillable water bottle. 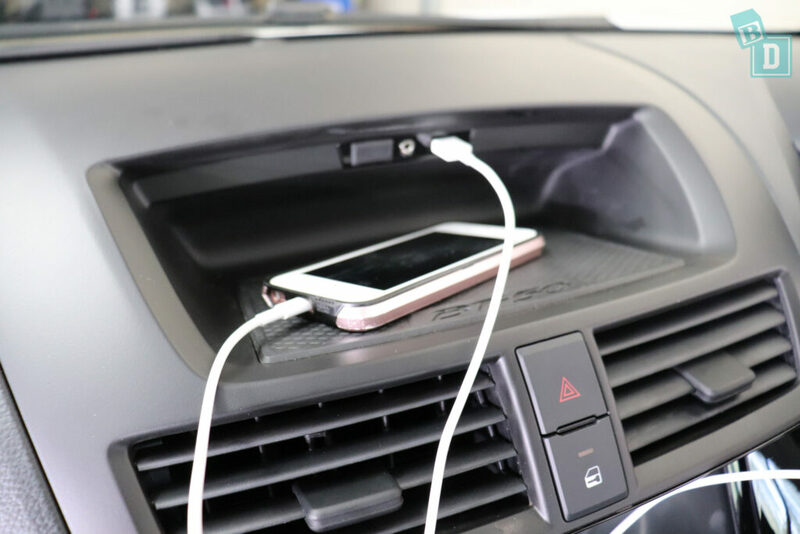 The glovebox is a good size, as are the central console storage box and a rubber lined tray on the dashboard below the USB and AUX sockets that is handy for holding and charging your phone. The BT-50 is pretty basic, a lot of the interior plastics have sharp edges and the storage areas feel like they are made to be hosed out so there is no padding or trims! The seats are comfy and adjusted with flimsy plastic handles. They are covered with synthetic, cheap uniform-like fabric and this would be quite difficult to get kids spills and detritus out of. The bare basics continue in the back seats where I discovered there are no ISOFix or top tether points!! You have to install your own top tethers! Utes do not come under the same regulations as cars and SUVs so do not have to meet the same standards and have top tethers installed… CRAZY!!! 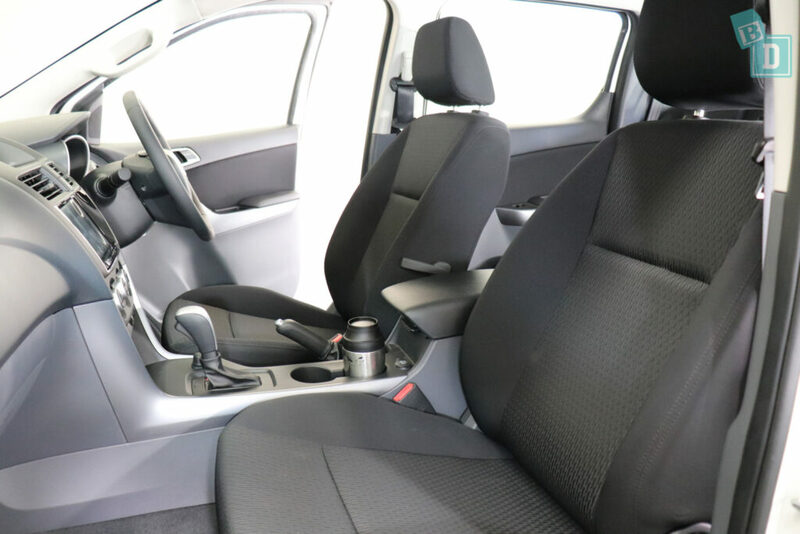 After installing my own top tethers, I could install two child seats in the back: The Britax Maxi Guard Pro (forward facing) and the Britax Graphene (rear facing), and I could sit between them too. The media screen is quite large and I could easily connect my phone to it. 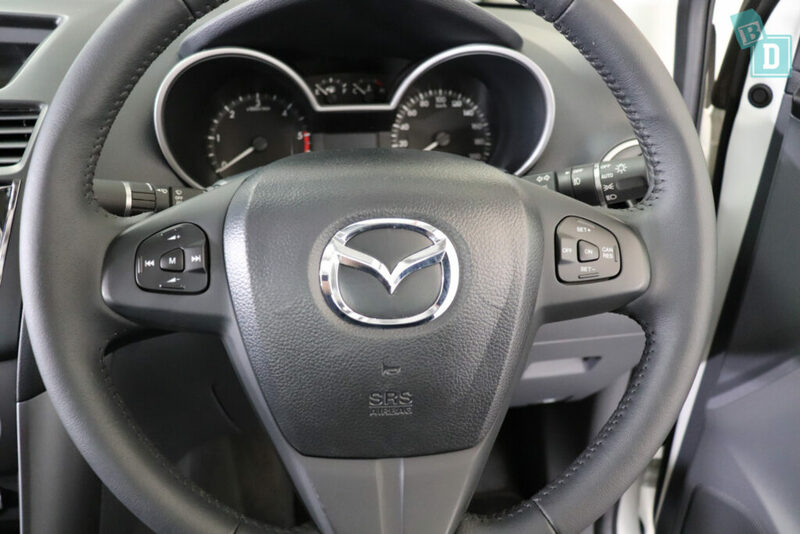 It has Apple CarPlay and Android Auto (it's the first Mazda to have these). 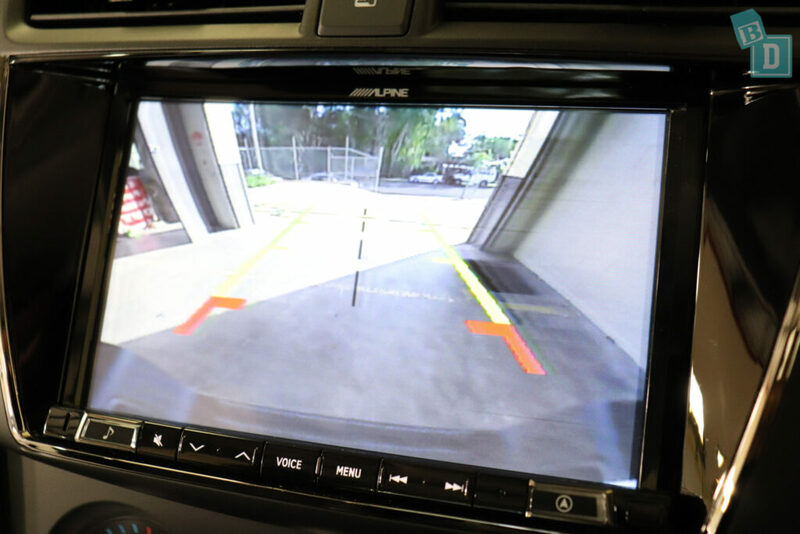 The reversing camera is a little pixellated but the image is nice and large. I really relied on it when reversing such a big vehicle. The BT-50 felt basic and bare bones and this helped with visibility and maneuverability. I could tell where the edges of the front and tray were and I wasn't worried about not seeing something. 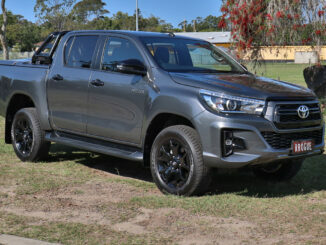 The BT-50 was a good ute to drive, although like most utes it does jostle and jiggle a bit giving rear passengers a bit of a bumpy ride and the engine noise is quite loud, especially when accelerating uphill. Overall once you have installed your own top tethers it is an enjoyable and versatile vehicle. The Mazda BT-50 scored a five-star ANCAP safety rating in 2011 and has six airbags as standard. How much can I get in the tray of the Mazda BT-50? I found I could fit 29 shopping bags in the BT-50's tray! 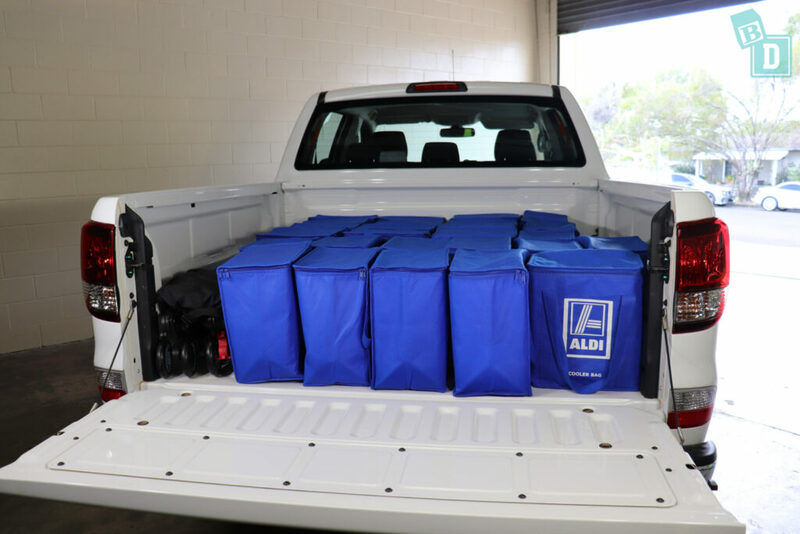 That is five more than the Nissan Navara, one more than the Mitsubishi Triton, the same as the Toyota Hilux and one less bag than the VW Amarok and Holden Colorado! Being a ute the storage in the tray is almost endless, however, I am 162cm tall and I found I could only really reach the two rows of bags nearest the tailgate. I could fit the Britax Flexx tandem stroller with 21 shopping bags. The Britax Flexx single stroller fitted with 22 shopping bags. 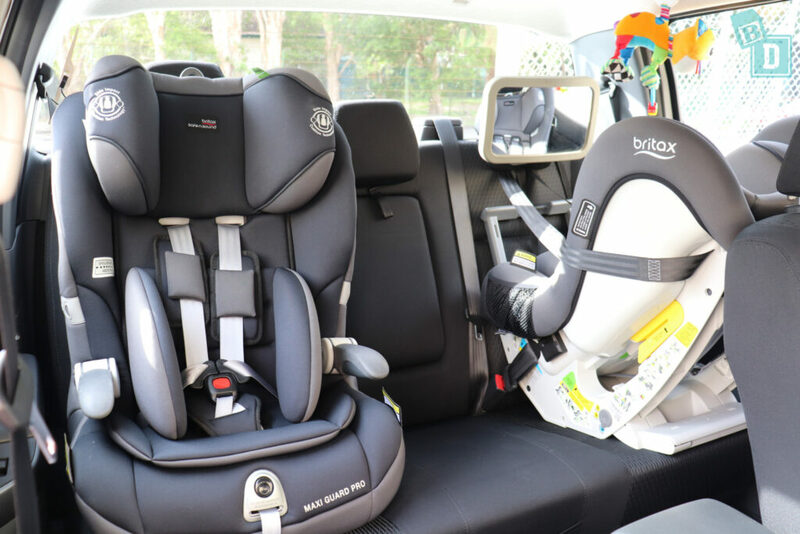 The Britax Holiday compact stroller fitted with 26 shopping bags but you could put that in a footwell and use the full tray. 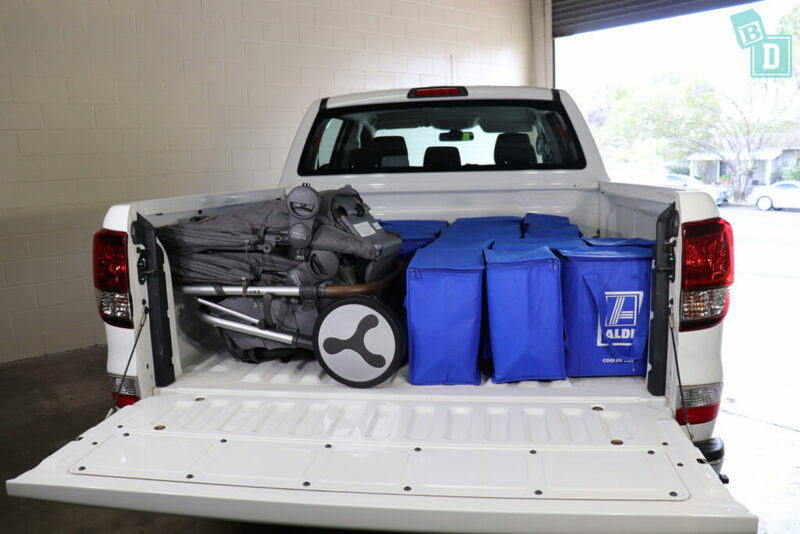 I always worry about ute tailgates as they tend to drop down at toddler head height, they do not fall slowly at all and are very heavy. They also have sharp corners that toddlers can walk into as well. Storage inside the cab of the BT-50 is limited. 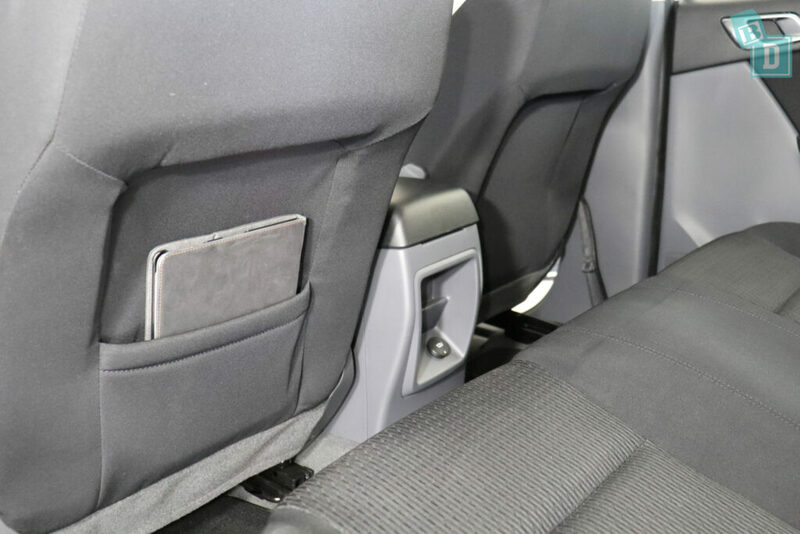 In the back there is one map pocket on the back of the passenger seat, it is small and would hold an iPad upright but doesn't conceal it. 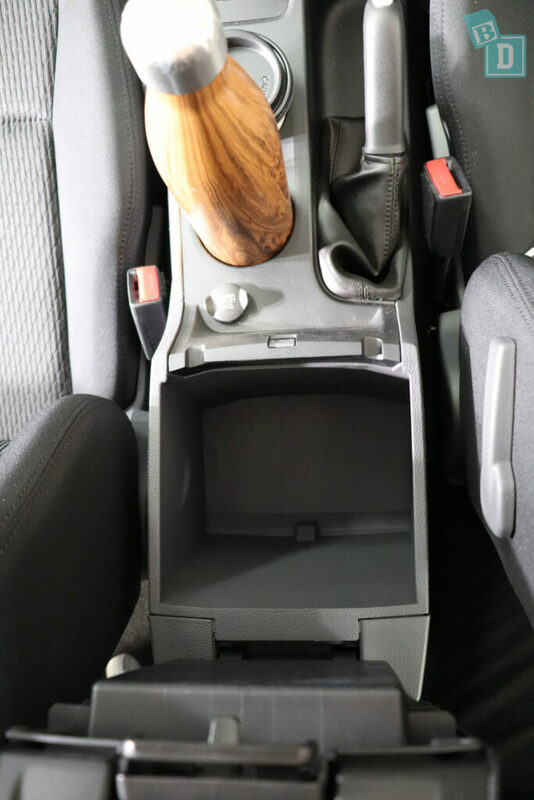 There is a fold-down armrest in the central back seat that has two cup holders in it. They would hold a disposable or reusable coffee cup or a 600ml or baby bottle but a large refillable water bottle doesn't fit. 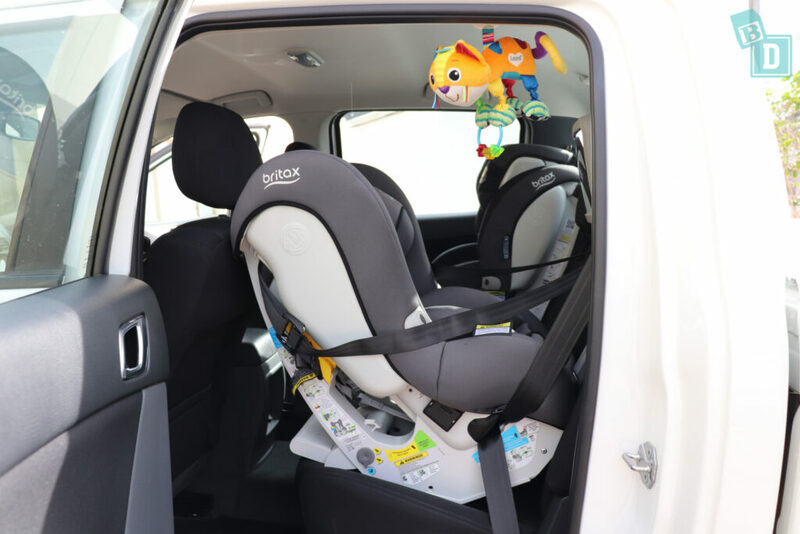 All the doors have handle wells with felt linings which is really good, I love these as little spaces to put whatever is in mine or my daughter's little hands when putting her in or taking her out of her child seat! 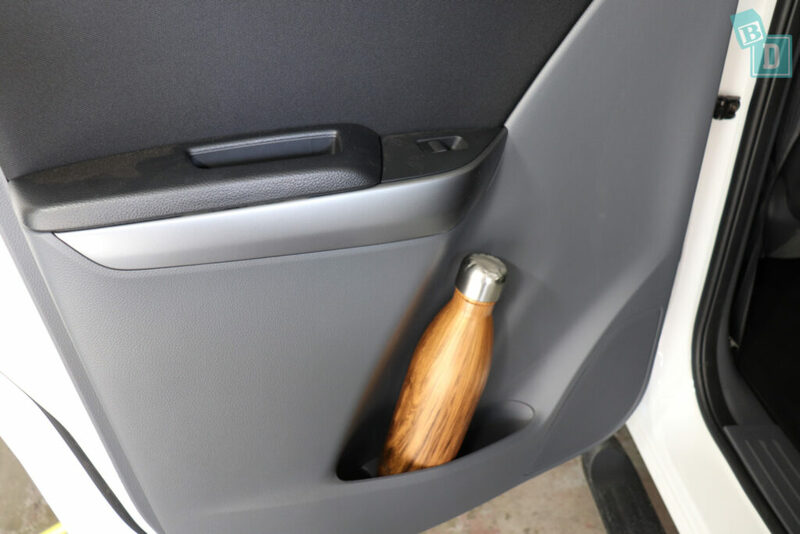 The rear door pockets in the back are smaller than in the front but they will hold a large refillable water bottle. In the front, the door pockets are bigger and will hold a large refillable water bottle and an iPad or wallet. 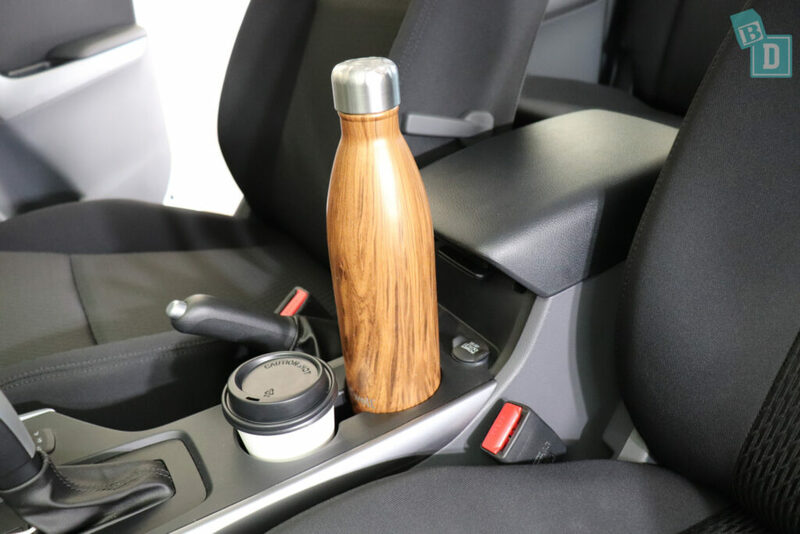 There are two cup holders in the central console that will hold a large refillable water bottle too or a disposable or reusable coffee cup fit in them too. There is a well in front of the gear lever that hasn't any lining so anything in there slides around. 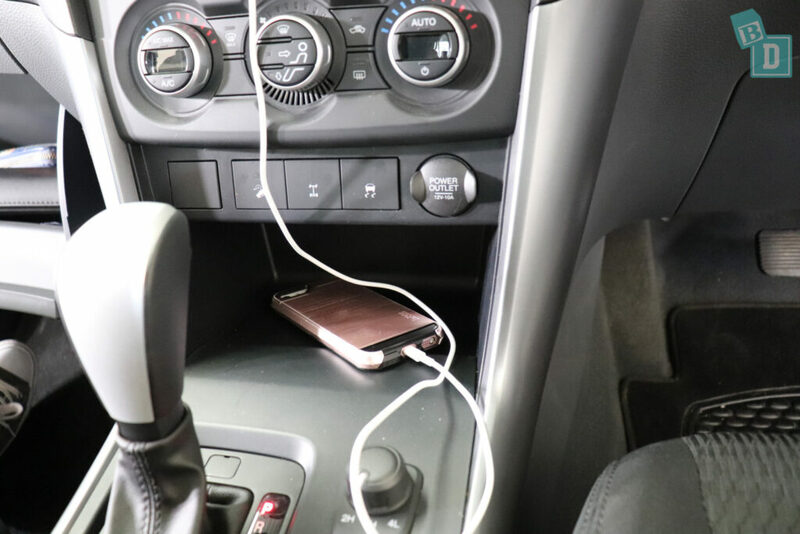 On top of the dashboard is a rubber lined tray with USB and AUX socket so I found that the best place for my phone to charge it while driving. The glovebox is a good size, it will hold my wallet, the manual and an iPad with room to spare! 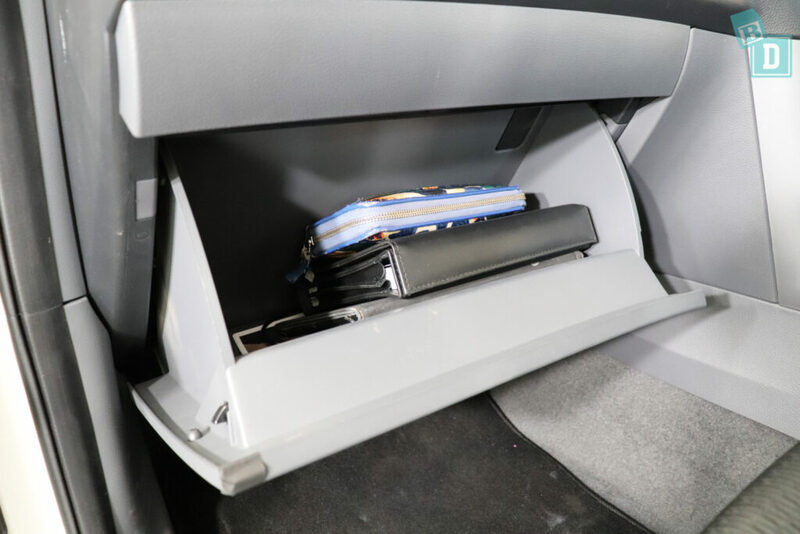 The central console storage box is a good size space, in the top is a tray that is good for separate storage and there is a 12V socket just in front of the central console box too. There is a glasses case in the ceiling and only one unlit vanity mirror in the visor on the passenger's side. 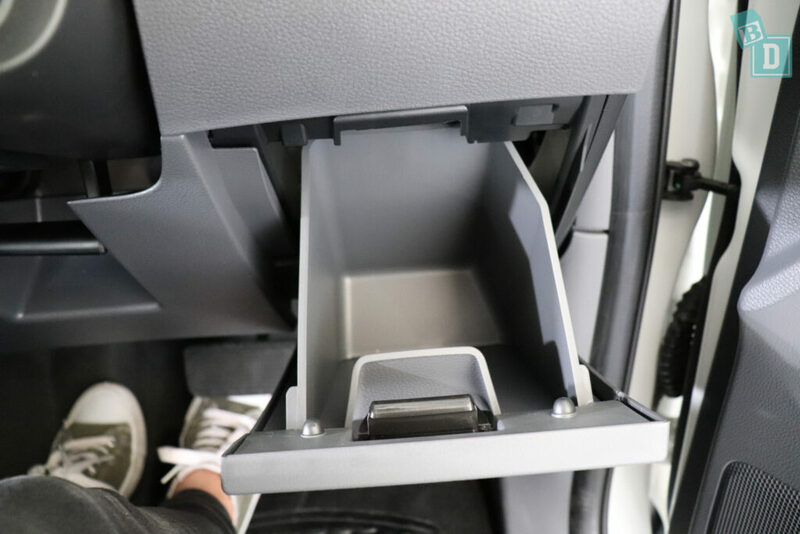 There is also a coin drawer by the driver's right knee. The storage in the BT-50 feels quite bare, there is no comfy padding to any of it like you would find in a car. It is mostly just bare plastic that will, of course, all clean easily but it will also rattle anything you put in there making it quite baby waking. 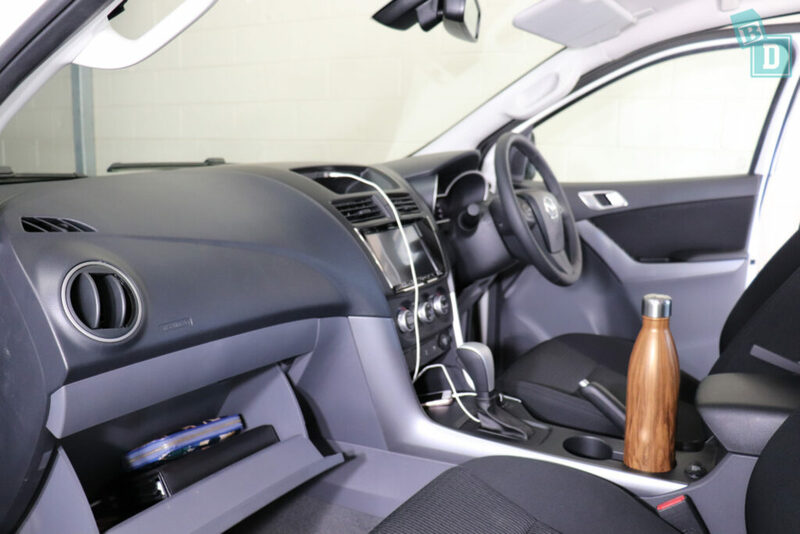 Will the Mazda BT-50 wake my sleeping child? The BT-50 is very minimal inside and the technology is quite minimal too, which actually makes a refreshing change! There are no parking sensors in the BT-50. There is a reversing camera and the image is not too bad but it is pixellated. There is no lane departure warning either and the indicators are nice and quiet, so shouldn't wake a sleeping baby! I found the sat-nav in the BT-50's system quite difficult to use and I didn't find a mute button for instructions. 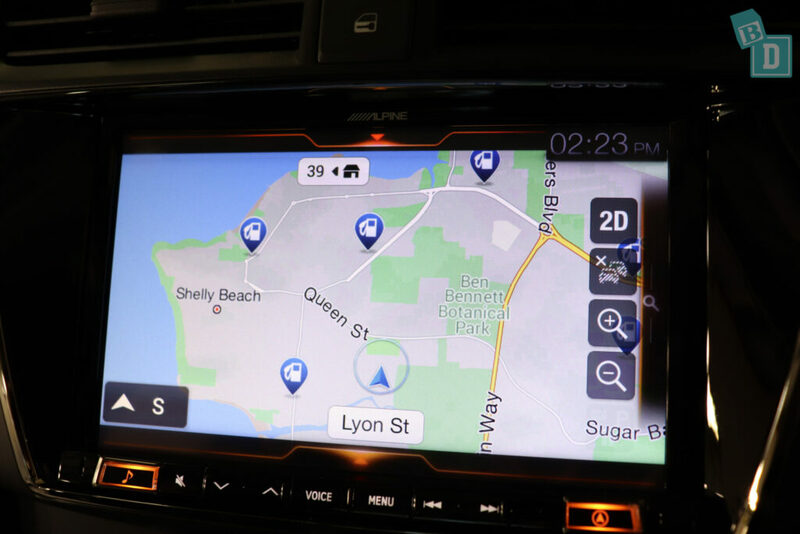 It has Apple CarPlay and Android auto so I found it much better to use the maps in that instead. 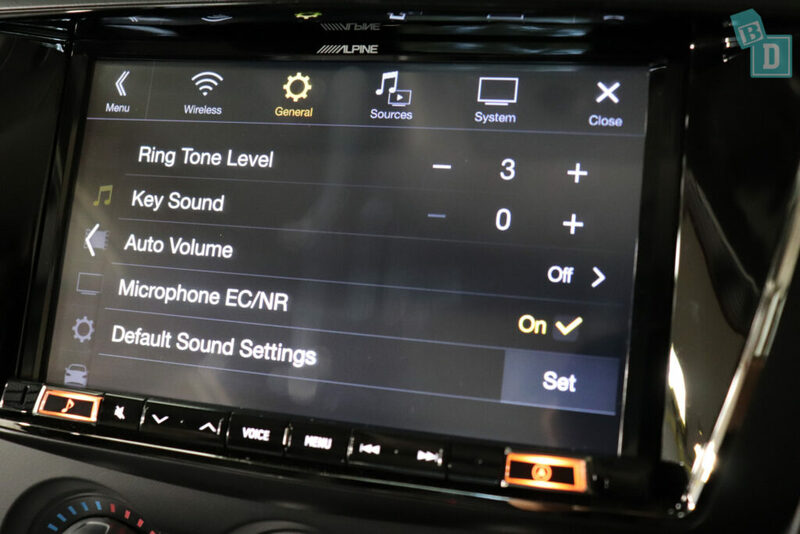 The system within the Mazda looks modern with its fonts and layout but also seems out of date. I did find the mute button along the bottom of the media screen useful when listening to music to mute it quickly. The screen also beeps to touch which is really annoying, I found the settings to turn that off deep within the screen settings but after turning the car off and on again it was beeping again! The windows open and close with a loud wining mechanism, the doors are very stiff to open and they close with a really loud baby waking slam! But at least you can come to a stop and get out of the BT-50 with the engine still running and get out without any alarms going off which is good. 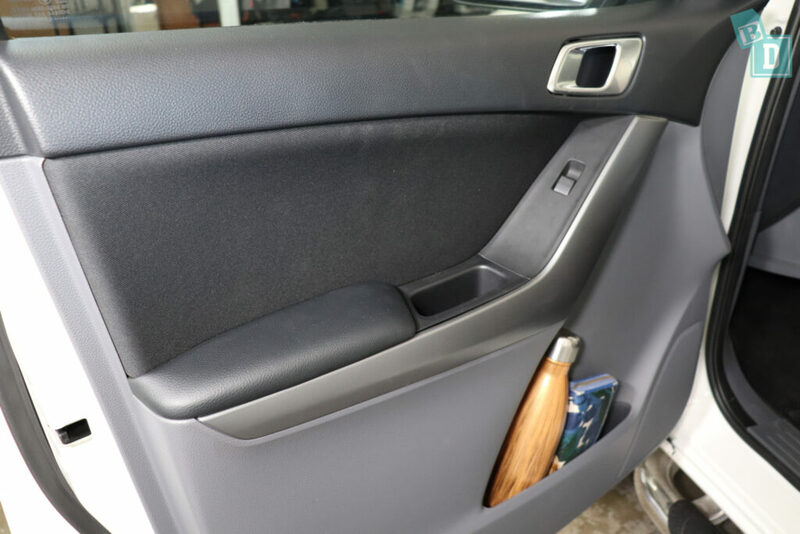 The windows can be locked from the control panel on the driver's door and the doors can be locked from a big button on the dashboard. The road noise is surprisingly good in the BT-50, however, the engine noise is grunty and you can definitely hear the gear changes and loud revving especially up hills and accelerating. Which is what you would expect with a vehicle of this type, as most of them sound more truck-like than a car. How many child seats can I fit in the Mazda BT-50? The answer is none!! Until you fit your own top tethers!! I had a shock with the Mazda BT-50 when I came to test how many child seats would fit and found there was no ISOFix and no top tethers! I searched all the usual hiding places for them and discovered after phoning a friend that the BT-50 doesn't come with any top tethers!! Utes are classified as commercial vehicles and come under different regulations and do not have to have top tethers fitted as standard. So be prepared to pay for and fit your own!! 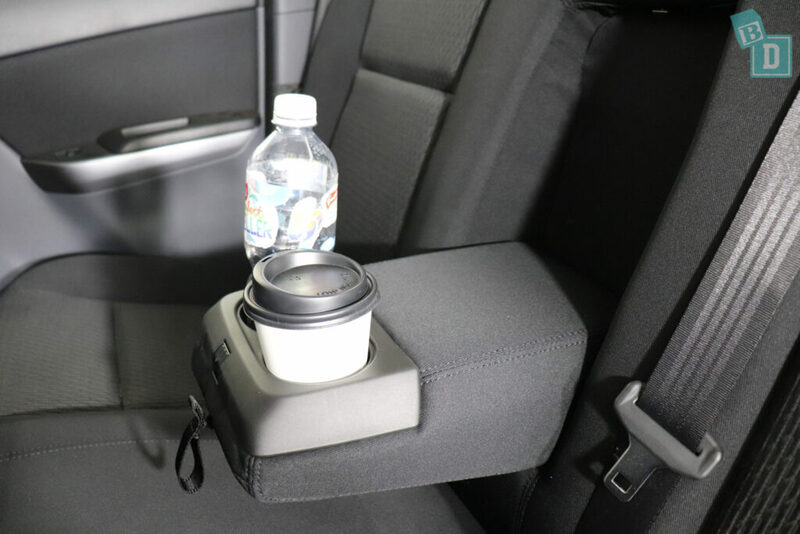 The rear seatback folds forward in one piece by pulling a woven strap near the headrest on the driver's side. Behind the rear seatback, there are two screw thread holes, one for each of the outer seats, where you can install the top tether points. When installing the child seats I did find it difficult to adjust the top tethers to be tight enough because of the adjustment buckle on the strap being behind the seatback and once it was clicked back into place you can't access it. I had to use the seatbelts with the child seats as there is no ISOFix. 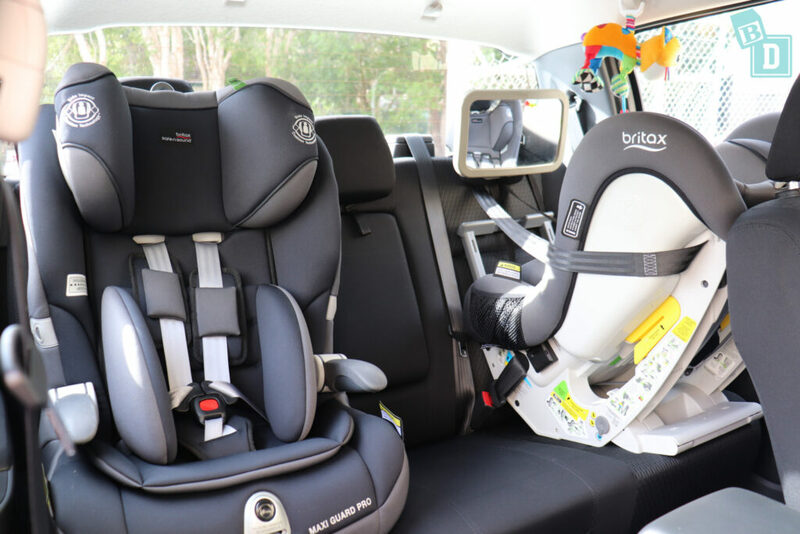 With two child seats installed in the outer positions, the Britax Maxi Guard Pro (forward facing) and the Britax Graphene (rear facing), there was room for me to sit between them. With only one child seat installed in the back, there was room to feed bub in the back row. Posting bub in and out of their child seat from outside the car was good, the doorways did feel quite narrow but they are tall. I really liked not having to bend to put bub in and instead, doing up the child restraints standing, at chest height! From inside the cab, there is room to pop them into their child seats too, however, I did feel in the back that the front seats were encroaching on my space. 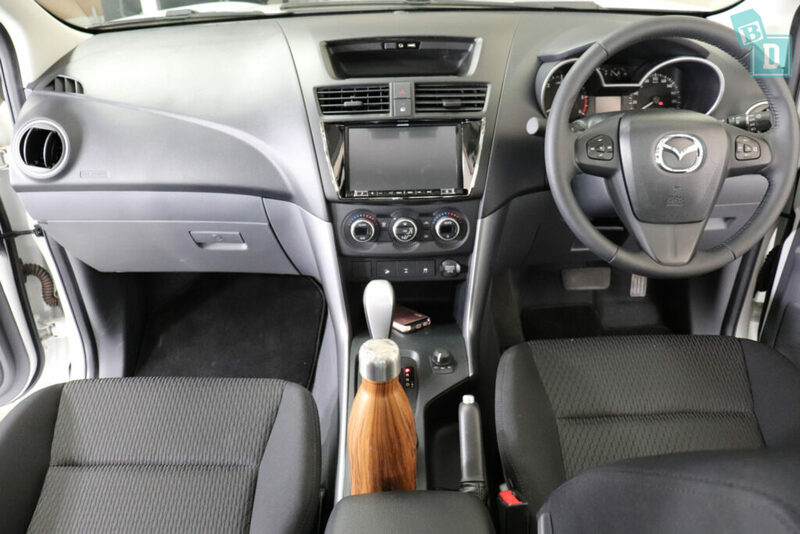 Is the Mazda BT-50 a comfortable family car? In the front the seats are basic but comfortable, you can adjust them manually with plastic levers on the sides, which all feel quite flimsy and plasticy! I found I could wear a ponytail in the front while driving which was good!! 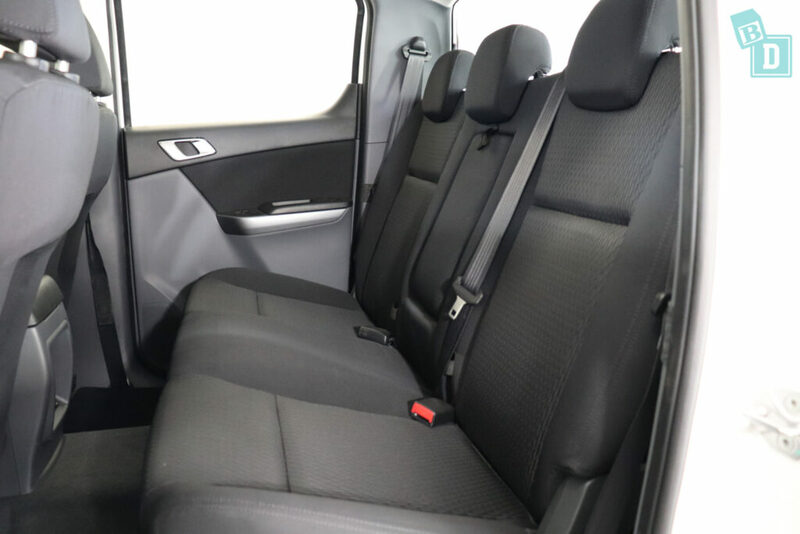 In the back, the seats are basic too but again relatively comfortable, even the central seat which has a small hump in the footwell but is quite comfortable too. All the seats are covered with a cheap suit or uniform style cloth which would not be very easy to keep clean with kids on board and all spills would rub into it. The steering wheel in the BT-50 only adjusts up and down not in and out which I found a little uncomfortable to reach it on long journeys. Also, the plastic panels had extremely sharp edges that I found I cut myself on straight away and knew to be careful of from then on! The cruise control was really good on motorways at high speeds and even on flat or straight roads at low speeds but as soon as the roads were undulating then it would race away with itself and get up to 10km over the set speed. The ironic thing was I was using the sat-nav at the time too and it kept announcing that I was exceeding the speed limit for the road I was on!! Using the cruise control was simple, the buttons on the right of the steering wheel were easy to use and locate. 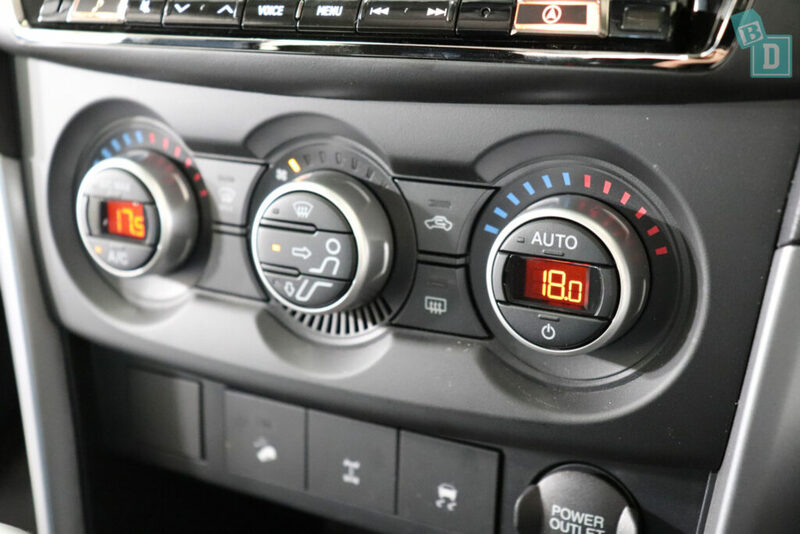 The airconditioning controls in the BT-50 look over complicated but you soon realise they are quite easy to use and I like that they are centrally located below the media screen. There are four vents across the dashboard; two small horizontal ones in the middle and one that's round at either end. I'm not a huge fan of these round vents as they are small and feel really cheap. There are no air vents in the back. The visibility for the driver is not too bad, the windows are not as big and deep as I have experienced in some utes and they seem to slope up slightly at the back, making visibility a little harder. You do need to rely on your side mirrors and reversing camera a lot. I did find I knew quite quickly where the extremities of the BT-50 were, making maneuvering and parking easier. There doesn't seem to be the bulky body on the BT-50 that other utes feel like they have and I could see the ends and sides of the vehicle. One thing I have noticed since being a mum is I hate it when I reach a destination or get home from being out and Tulsi has either done really well in the car or she is screaming her head off and I have done really well to keep it together for the entire journey (usually the latter!!) and it takes 10 minutes to park the car! It can be really stressful. Usually I dread when we get Utes as they take longer in our tight apartment block carpark, but the Mazda BT-50 was not too bad. The interior lights use simple button controls in the front and back. 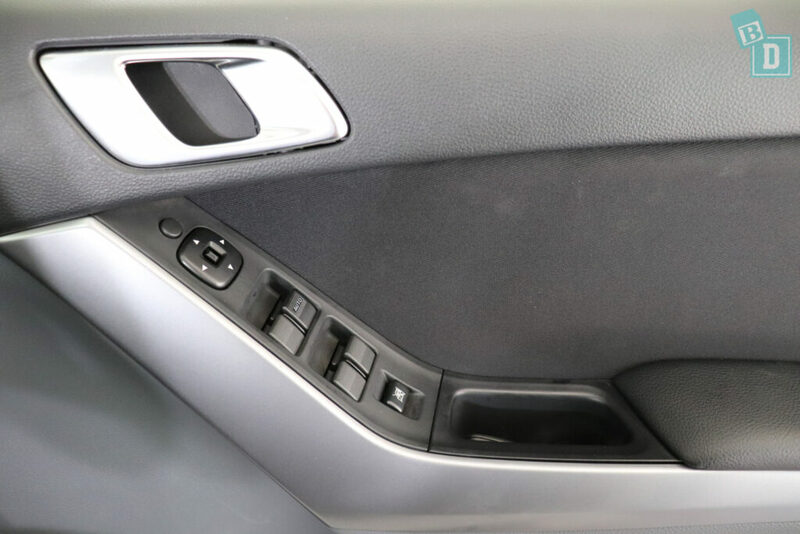 The rear ones are easily reached from the front so you can turn them on and off for rear passengers while driving. Also if I am traveling home and it is getting near to bed time and I DEFINATELY DON’T want her to fall asleep in the car as even a 5minute nap in the car means bed time is all over!!!! I lean back and pop the light on so it’s not dark and try to keep her awake!! Along with screaming/singing at the top of my voice!!! 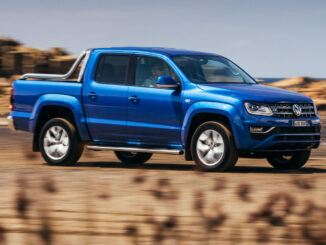 The BT-50 is a fun ute to drive! It feels jiggly and jostly and rolls around a bit on the road, giving child seat passengers a little roller coaster ride! There are handles above both back doors that are well positioned to hold a baby toy. There are two 12V sockets in the central console; one either side of the gear lever. The general aesthetics of the BT-50s interior is that it just feels so basic and plastic. The edges feel sharp and the levers flimsy and as if everything is the bare bones plastic with no trims or padding! All the plastic surfaces would be easy to wipe clean but the seats not so. 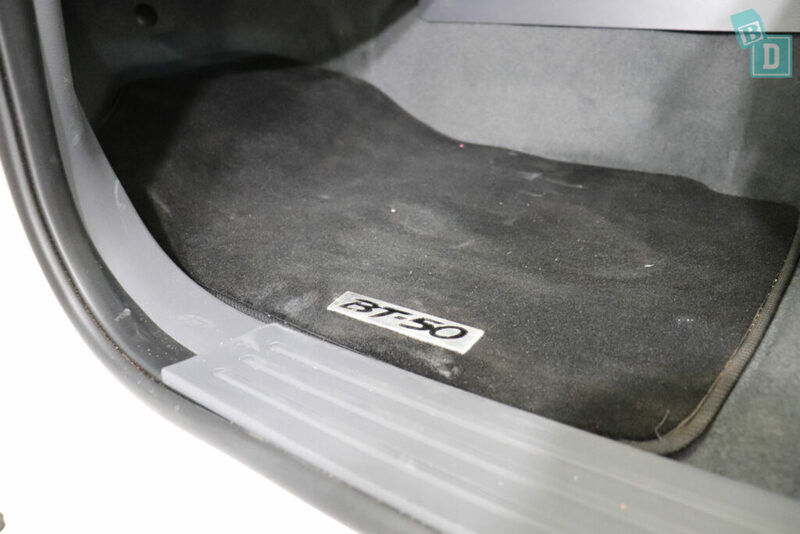 The floor mats in the BT-50 are black carpet, but I think I'd prefer rubber mats with kids as they are easier to hose down! The model I drove doesn't have keyless entry and you have to turn the key into the ignition to start it… old school!! The tailgate drops straight down without a slowing motion and I always worry with utes as the tailgates are at toddler head height that they will either drop on their head or they will walk into one of the corners. 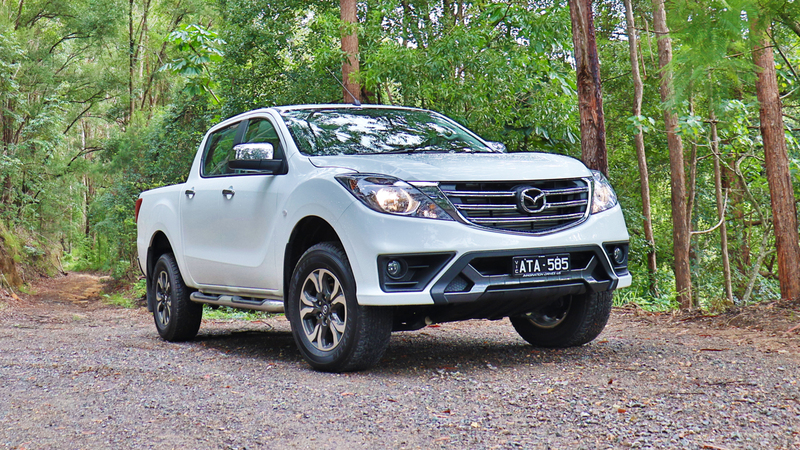 How safe is the Mazda BT-50? The Mazda BT-50 scored a five-star ANCAP safety rating in 2011, getting a total of 35.72 out of 37 overall. For the frontal offset test, it got 15.72 out of 16 and 16/16 for the side impact test. It got 2/2 for the pole test and in the pedestrian protection test, it was rated acceptable. 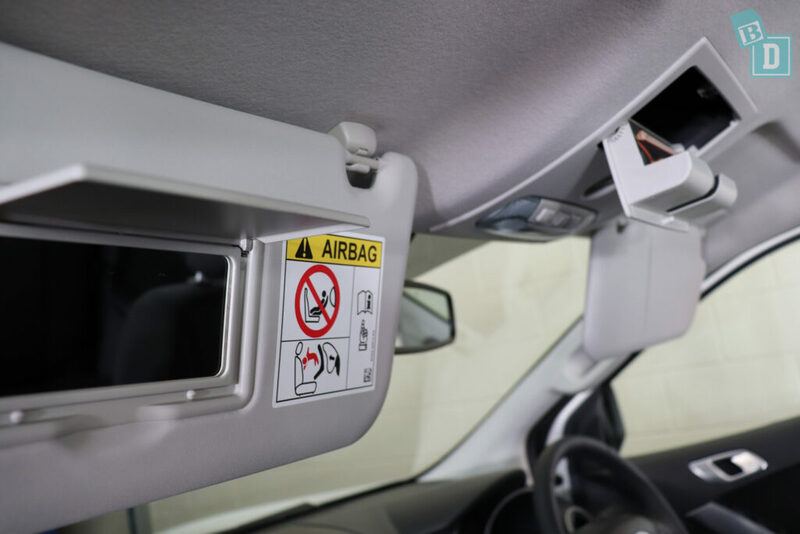 Six airbags come as standard; there is dual frontal airbags and front side airbags and side curtain airbags for the front and the rear side passengers. As standard, the BT-50 comes with anti-lock brakes (ABS), electronic brake force distribution (EBD), emergency brake assist (EBA), dynamic stability control (DSC) with traction control system (TCS), load adaptive control (LAC), roll stability control (RSC) and trailer sway control (TSC). As well as hill launch assist (HLA) and hill descent control (HDC).